Author-level metrics are citation metrics that measure the bibliometric impact of individual authors. H-index is the best known author-level metric. Since it was proposed by JE Hirsch in 2005 it has gained a lot of popularity amongst researchers while bibliometics scholars proposed a few variants to account for its weaknesses (g-index, m-index are good examples). Thomson Reuters provides list of Highly Cited Authors. These are individuals who, in the last 10-year period, boast the highest cumulative number of highly cited papers (papers placing in the top 1% of the distribution) for their publications across 21 broad subject categories. The 2015 edition of Highly Cited lists slightly over 3,000 authors. Essential Science Indicators are a great tool in identifying authors with in the last 10 years received enough citations, in their respective disciplines, to place them in the top 1% of all authors in Web of Science. Other metrics originally developed for academic journals can be reported at researcher level: author-level eigenfactor and the author impact factor (AIF) are such examples. 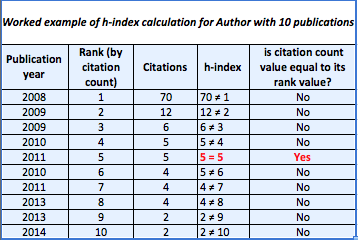 In other words, to have an h-index of 5, an author has to have 5 publications, each receiving at least 5 citations. The criticisms of the h-index include the fact that it does not account for highly cited papers (your h-index is the same whether you most highly cited paper has a 100 or 10 citations. Another criticism is that it does not account for the career span of the author - because it is a simple function of productivity and impact, authors with longer career spans (and more publications will always have higher scores).To help with these weaknesses h-index variants had been proposed. g-index is a variant of the h-index that, in its calculation, gives credit for the most highly cited papers in a data set. In the words of Leo Egghe, its inventor: "Highly cited papers are, of course, important for the determination of the value h of the h-index. 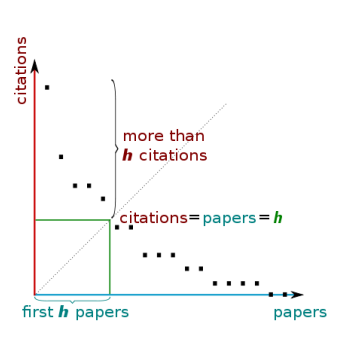 But once a paper is selected to belong to the top h papers, this paper is not “used” any more in the determination of h, as a variable over time. Indeed, once a paper is selected to the top group, the h-index calculated in subsequent years is not at all influenced by this paper’s received citations further on: even if the paper doubles or triples its number of citations (or even more) the subsequent h-indexes are not influenced by this." The g-index is always the same as or higher than the h-index. m-index is another variant of the h-index that displays h-index per year since first publication. The h-index tends to increase with career length, and m-index can be used in situations where this is a shortcoming, such as comparing researchers within a field but with very different career lengths. The m-index inherently assumes unbroken research activity since the first publication. Author Impact Factor (AIF) is the extension of the Impact Factor to authors. The AIF of an author A in year t is the average number of citations given by papers published in year t to papers published by A in a period of Δt years before year t. AIF is capable to capture trends and variations of the impact of the scientific output of scholars in time, unlike the h-index, which is a growing measure taking into account the whole career path. For more information see: Pan, RK; Fortunato, S (2014). "Author Impact Factor: Tracking the dynamics of individual scientific impact". Scientific Reports 4: 4880. Author-level Eigenfactor is an attempt to use Eigenfactor methodology (originally developed to rank journals), to create a ranking list of authors in SSRN. For description of the study and list of ranked authors see: West, JD; Jensen, MC; Dandrea, RJ; Gordon, GJ; Bergstrom, CT. (2013). "Author-level Eigenfactor metrics: Evaluating the influence of authors, institutions, and countries within the social science research network community". Journal of the American Society for Information Science and Technology 64 (4): 787–801. Where to find your h-index? There are a number of sources where you can find your h-index. Please note that the value of the index may vary depending on the source of information (number of indexed publications, time span, etc.) For instance, h-index derived from Google Scholar tend to be higher than that based on Web of Science or SCOPUS data. In Web of Science you can see a calculated h-index for a group of publications (i.e. 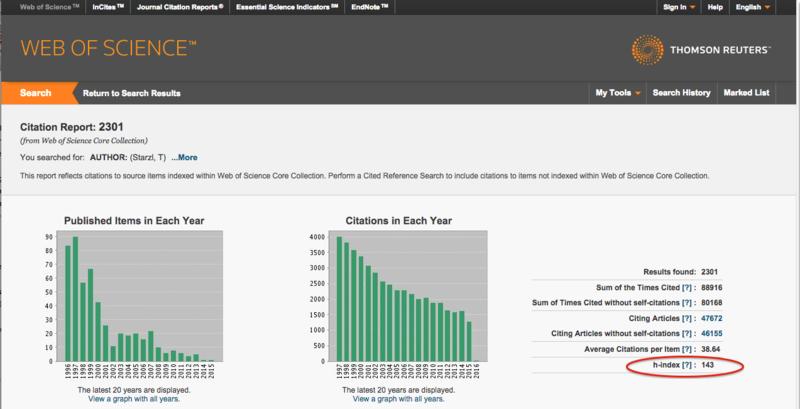 all publications by an author) through its "create citation report" function. 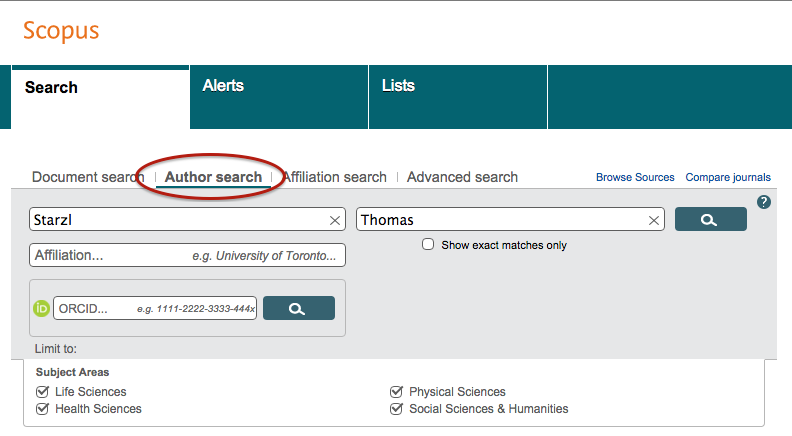 To identify all publications by an author you can use Author Analyze search function or enter author's ORCID or ResearcherID identifier (if known). 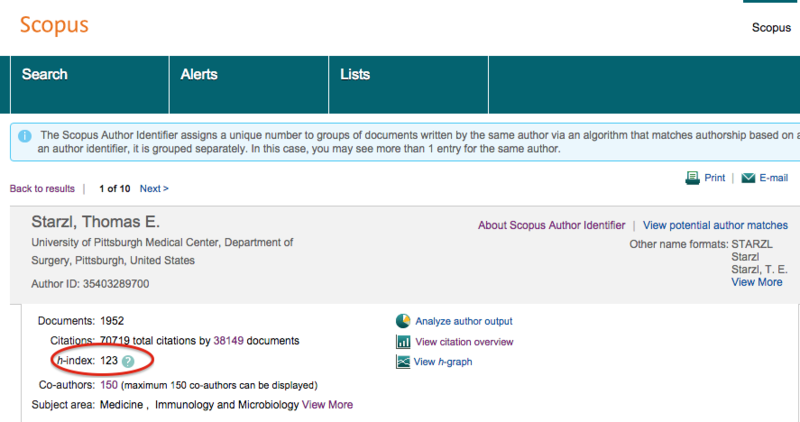 SCOPUS has an "author search" form allowing for searching for author names, ORCID and SCOPUS identifiers and institutional affiliations. The return page is an author summary page with a number of author information including h-index. Note: Currently (2015-2016) SCOPUS is extending its citation counts coverage for pre-1996 publications. If you have pre-1996 publications they may not be part of your h-index calculation at the moment. Google Scholar is another source of h-index information. It requires creation of Google Scholar profile before providing metrics. Refer to our LibGuide on research impact to learn to how create Google Scholar Profile.